Artifacts Gallery - How Many Angels Can Dance on the Head of a Pin? The question is sometimes attributed to medieval philosophers but nowadays it’s used as a metaphor for debating irrelevant minutia while more pressing concerns bang at our door. 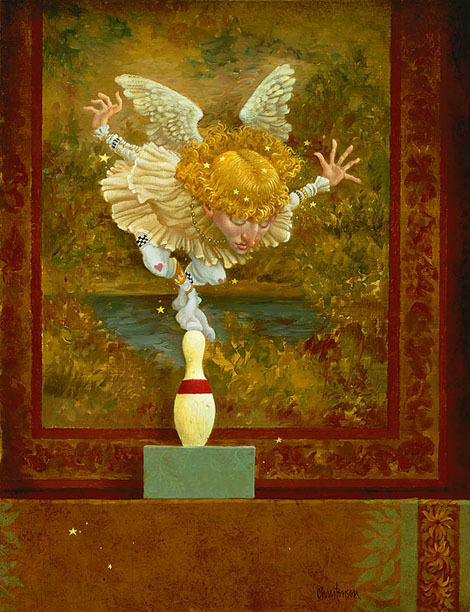 Of course, in the hands of James C. Christensen, "magic" is in the metaphor and with this never-before-published gem he turns the idiom on its head. The result is both whimsical and inspirational. This solo angel is barely holding it all together as he sticks that landing like a figure skater at Olympic try-outs.